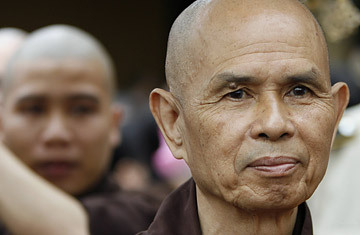 Nhat Hanh has a long history as one of Buddhism's truly international spokespeople. ["Thich" is a name adopted by all Vietnamese monks and nuns upon ordination.] He first came to global attention in the early 1960s, when he led fellow monks in his native Vietnam to oppose the prosecution of the war there by either side  a position that eventually led to the deaths of several of his followers and his own exile. He continued his opposition from the United States, where his counsel was influential in convincing the Rev. Dr. Martin Luther King Jr. to announce his own opposition to the conflict. King subsequently nominated Hanh for the Nobel Peace Prize. He continued speaking and writing (in a variety of languages  he is a polyglot), working out a theory of "engaged buddhism," exploring the commonalities between his philosophy and other world faiths, attaining a popularity (and book sales) in the U.S. second only to that of the Dalai Lama, and lending his opposition to a series of world conflicts, including America's involvement in Iraq. He now lives in a monastic community he founded in France. Buddhism has three major branches: Theravada, historically the simplest, which is now practiced primarily in South Asia and is the faith of the Burmese monks; Mahayana, of which Hanh's own Zen discipline is part; and the Dalai Lama's Tibetan branch, which is labeled Vajrayana. In conversation, however, Hanh stressed the unity of the three and their solidarity with the embattled Burmese. "They also practice mindfulness and concentration inside like us," he said. He said the Burmese monks had "done their job. It is already a success because if monks are imprisoned or have died, they have offered their spiritual leadership. And it is up to the people in Burma and the world to continue." Pressed on the question of martyrdom, he replied: "We nourish the awareness that monks are being persecuted and continue to suffer in order to support the people in Burma for the sake of democracy." Perhaps the most striking gesture made by his Burmese bretheen before they were attacked was the symbolic act of turning their begging bowls upside down. In a Western culture where almsgiving happens in the confines of a church or synagogue, this may have seemed odd. But Nhat Hanh pointed out that it was a powerful statement of denial to the regime leaders. "In Buddhist culture," he explained, "offering food to the monk symbolizes the action of goodness, and if you have no opportunity to support the practice of spiritualilty then you are somehow left in the realm of darkness." Their supreme act of condemnation: giving the regime no chance to do good. The importance of monks in Burma was also suggested, in a grisly way, by reports that hundreds of Burmese soldiers had been arrested for refusing to shoot at them. In the U.S., the connection between Buddhism and social action is not readily understood. Many Americans perceive Buddhism as a philosophy that regards this world as transitory and unimportant; in this country, the most widely disseminated kind of Buddhism is a stripped-down version of Theravada practice with a strong emphasis on ritual supplemented by meditations on meta, or loving-kindness. Said Nhat Hanh: "Meditation is to get insight, to get understanding and compassion, and when you have them, you are compelled to act. The Buddha, after enlightenment, went out to help people. Meditation is not to avoid society; it is to look deep to have the kind of insight you need to take action. To think that it is just to sit down and enjoy the calm and peace, is wrong." After a brisk interview about Burma, Nhat Hanh gave some sense of the topics that were most on his mind that afternoon: He talked first about global warming and then about eating low on the food chain. He told a Buddhist story of a couple who were forced to cross a desert with their young son and, running out of food, killed and ate the child, whose diminishing corpse they carried with them, constantly apologizing to it. "After the Buddha told that story, he asked the monks, 'Do you think the couple enjoyed eating the flesh of their own son?'" Nhat Hanh recounted. "The monks said 'no, impossible.' The Buddha said, let us eat in such a way that will retain compassion in our heart. Otherwise we will be eating the flesh of our son and grandson." It was a stark and stern reminder of the steel beneath the flowing robe, gentle smile and peaceful demeanor.